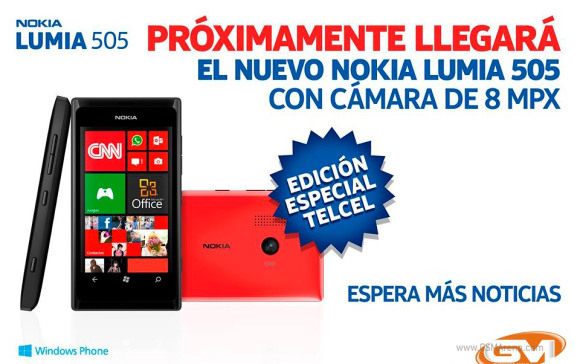 The Mexican retailer Guerrero Móvil teased an upcoming Nokia smartphone, called Nokia Lumia 505. It will be exclusive (at least initially) to the network of local carrier Telcel and should become the cheapest Nokia WP device to date. The Lumia 505 specs are mostly unknown for now - all the carrier's Facebook account gave us was the 8 megapixel camera. We can also see that there's not going to be a flash of any kind alongside the camera. However, the Windows key at the front features the old WP logo, so it's all but certain that the smartphone will be running some Windows Phone 7 version. Now a closer look at its homescreen shows the support for resizable live tiles, so it's obvious that the smartphone will be running Windows Phone 7.8 out of the box. There are also rumors of a 4" WVGA display, 800MHz CPU, 4GB of storage and 256MB of RAM, which make sense, but are yet to be confirmed. It would be a strange if Nokia invested too much effort in the design of a smartphone that is going to be exclusive to a Mexican carrier, so the Lumia 505 is most probably little more than a redesigned Lumia 510. Guerrero Movil promised to reveal more information on the Nokia Lumia 505 in a week, so we won't have to wait long to find out. 1 foot = 30.48 cm btw In my country the biggest business of phone service shops is replacing iphone broken glasses. Iphone 4/4s design in my opinion is a super cool look, but it's true, they may shatter glasses falling from 10 cm. Not bad at all, but i'd prefer it costs some bucks more and have wp8.